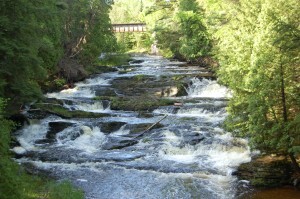 Michigan is home to hundreds of waterfalls (almost all of them are found in the Upper Peninsula), and they continue to be a popular spot to visit. 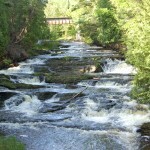 While there’s no arguing that a visit to one of our larger waterfalls like Upper Tahquamenon Falls, Bond Falls, or Agate Falls is a thrilling experience, other places offer multiple drops over a short distance. We put together a list of the Best Michigan Waterfalls for what we call the “waterfall experience.” Each of these stops features stunning scenery and multiple drops, we consider them Michigan’s best stops for those who want to see a lot in a short amount of time. Two of these stops are located within state parks and require a Michigan Recreation Passport or day pass to visit, the others can be visited and viewed completely free of charge. These seven Upper Peninsula locations are our top picks for those looking to get the most out of a visit or who have limited time and want to make it count. Enjoy! Falls River Falls, L’Anse – The Falls River makes many drops as it heads to Lake Superior, and while none of them are more than 15 feet tall the quantity of waterfalls here is hard to beat. The best hike starts at a small waterfront park near the intersection of Main St. and Railroad St. A well-worn path follows along the east bank of the river next to a fence, and within a quarter mile you will start to see small waterfalls. 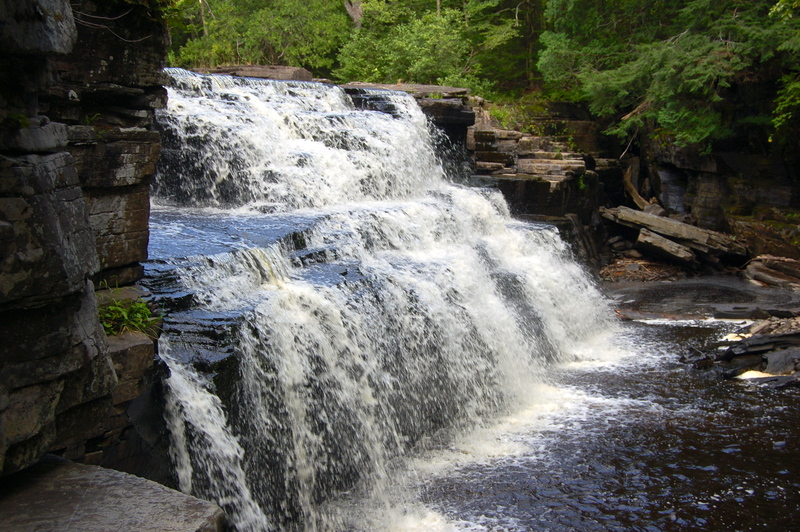 Lower Falls features several small drops and the remnants of an old dam. 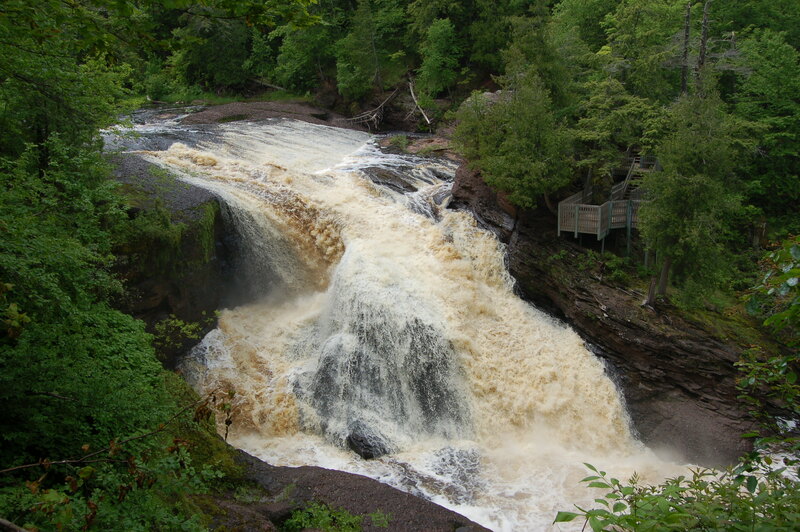 Middle Falls (shown above) is a series of small drops that combine for a jaw-dropping scene when viewed from above the river. Following the path closer to the railroad trestle provides views of Unnamed Falls, a drop of five feet. 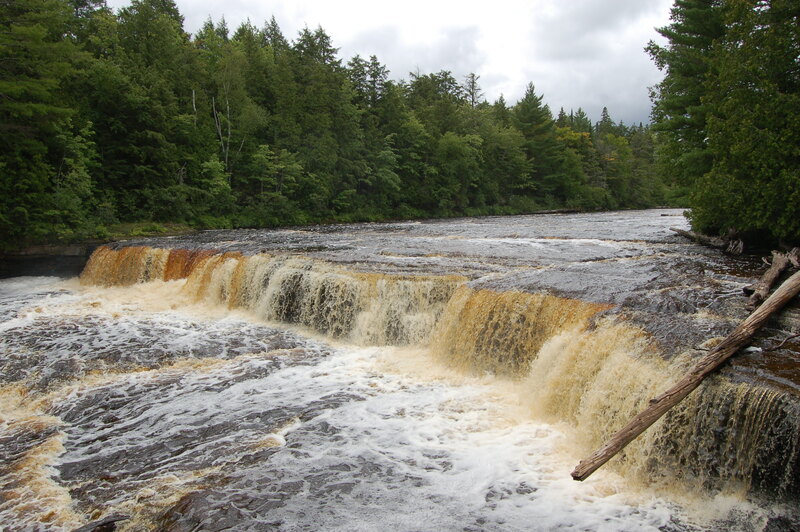 While the Upper Falls is on private property, you can drive a few miles south on US-41 and follow our directions to Power House Falls and Power Dam Falls. Power House Falls is a 15 foot tall waterfall next to an old power station, at a point where the river is roughly 40 feet wide. Power Dam Falls is a set of small drops above the power house where a dam once stood. You can check out all of the Falls River Falls in an hour’s time, or take longer and check out all of the other small drops and beautiful scenery along the way. 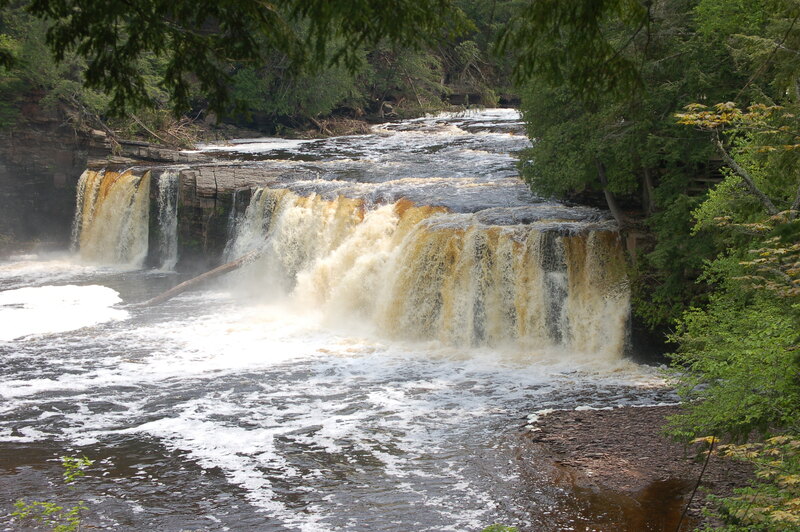 Black River Scenic Byway waterfalls, Bessemer – Not only is the Black River Scenic Byway one of the state’s most beautiful fall drives, it’s also home to five major waterfalls as the river heads to Lake Superior. 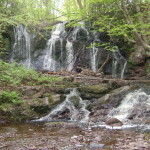 Four parking lots within a three mile stretch of road lead to five large waterfalls that are all reached by hikes of 3/4 mile or less on well-groomed trails. 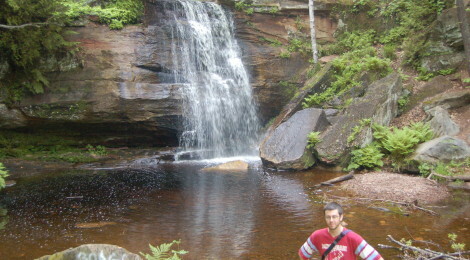 If you’re feeling ambitious you can make a six mile hike and visit all of the waterfalls without ever moving your car. Things start off with Great Conglomerate Falls, a 20 foot drop where the river splits around a large conglomerate rock (3/4 mile hike). The next parking lot leads to both Potawatomi Falls and Gorge Falls. Potawatomi Falls is reached after a short hike and its viewing platform is wheelchair accessible. This waterfall is 30 feet tall as the river starts to narrow before it reaches a gorge. Gorge Falls is one of the more scenic drops on the river, as the water narrows and makes a 25 foot drop. The hike is easy, though there are some stairs leading down to the observation platform. 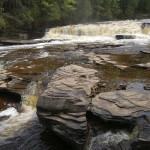 A 1/4 mile walk from the next parking area leads to Sandstone Falls, a 10 foot drop on the river as it flows between two large rocks. There are no barriers or platforms here, leaving plenty of room to explore and get up close to this waterfall. The final drop on the river is Rainbow Falls, a stunning 30 foot plunge that can be viewed from either side of the river. The best views come from the east side, which requires a one mile hike from the harbor. You can view all five Black River waterfalls in a few hours’ time, and this is a great example of the different types and sizes of waterfalls in Michigan. From US-2 in Bessemer, head north on CR-513 (N. Moore St./Black River Rd.) and follow it for about 12 miles to the parking areas for the waterfalls. 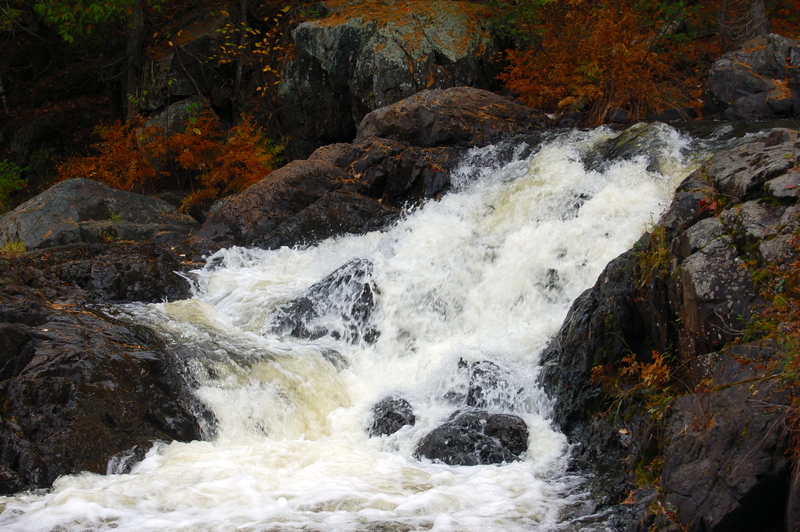 Gabbro Falls is on the same river and less than five miles away from Bessemer and the start of the scenic byway. Lower Tahquamenon Falls, Tahquamenon Falls State Park – The Upper Tahquamenon Falls get most of the attention at this park, but the Lower Falls offer a unique chance to experience some smaller waterfalls up close. The hiking path here allows distant views of some of the larger drops near the island and puts you almost on top of a few other cascades, but there is a chance for even better access. You can rent a rowboat from a state park concession area near the hiking path, which allows you access to the island that the river and falls surround. There are multiple drops here, from the 100 foot wide, 20 foot tall drop shown above to small rapids and another 10 foot drop that provides a perfect spot for cooling off in the summer. The island only take an hour to explore, but chances are you’ll want to spend more time than that exploring and taking in the views. 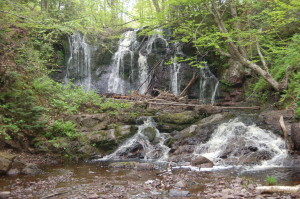 Canyon Falls, Baraga County – A well-worn trail of less than a mile takes visitors from a roadside rest stop to Canyon Falls, a dramatic 15 foot plunge into an impressive gorge. Along the way the trail runs parallel to the river so you can see small drops before it narrows as it is forced into the canyon. There are plenty of great views here, and from Canyon Falls the trail continues on (it is rougher from this point on), following the canyon as another small waterfall appears after a quarter mile, and the Upper Falls (a slide falls) can be seen after a half mile. The Canyon Falls rest area is located on US-41, 10 miles south of L’Anse. You might even see people fishing or cliff jumping at the falls here! Dead River Falls, Marquette – There’s a good chance you’ll lose count of how many waterfalls there are on the Dead River in Marquette. The hiking trail here can be a bit challenging but it is worth pressing on past the small lower falls to get to some of the larger drops upstream. Beautiful in any season, there are three large drops of 15-25 and many more 5-10 foot drops. The wild setting here allows for an at-your-own-risk adventure, which only adds to the fun. From US-41/M-28 in Marquette, head north on Wright St./CR-492 and follow it to CR-HQ/Forestville Basin Trail. The hike from the parking area to the falls is less than a half mile, and Reany Falls can be reached from the same parking area. Presque Isle River waterfalls, Porcupine Mountains Wilderness State Park – a two mile loop hike at Porcupine Mountains Wilderness State Park covers both banks of the Presque Isle River and provides amazing views of Manabezho Falls, Manido Falls, Nawadha Falls and many other unnamed cascades. Manabezho Falls is a 25 foot drop on the river, and easily one of the largest and most beautiful waterfalls in the Western Upper Peninsula. Manido Falls is a set of drops just above Manabezho Falls, and depending on the season on water flow it can look incredibly different on each visit. Nawadha Falls is a 15 foot tall stepped falls in a rugged setting, best viewed from the east side of the trail. 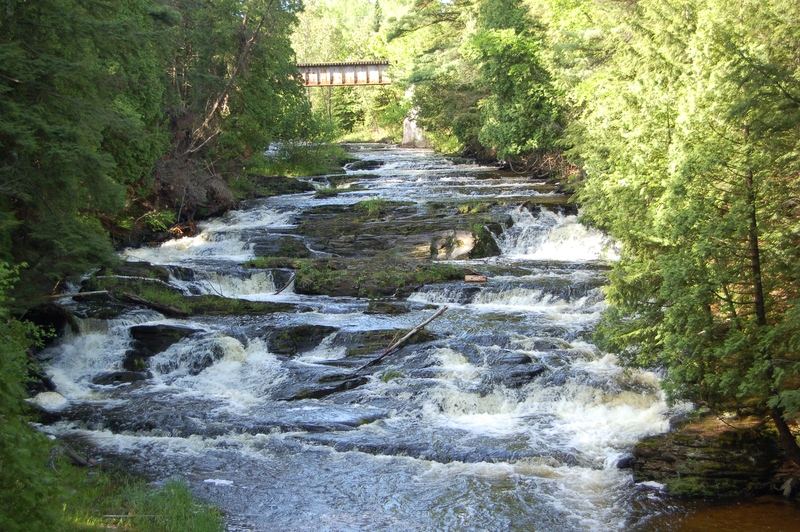 The power of this river is on full display here, shown by ‘pothole’ formations like the ones seen in an often-photographed unnamed small cascade seen from the footbridge that crosses the river near Lake Superior. To reach the trailhead, take CR-519 north from US-2 near Wakefield and follow it into the western unit of the PMWSP. Head past the ranger station, and when the road splits head for the day use area (opposite of the campground). 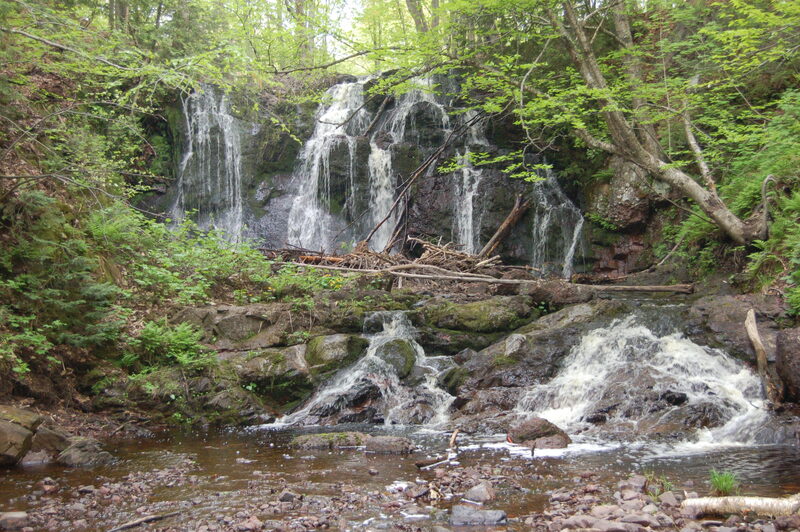 Hungarian Falls, Houghton County – We saved the best for last, as in our humble opinion there is no better spot for a true wilderness waterfall experience than at the Hungarian Falls Natural Area. Dover Creek makes three plunges of more than 20 feet here and depending on water levels there can be up to 10 waterfalls here of various sizes. 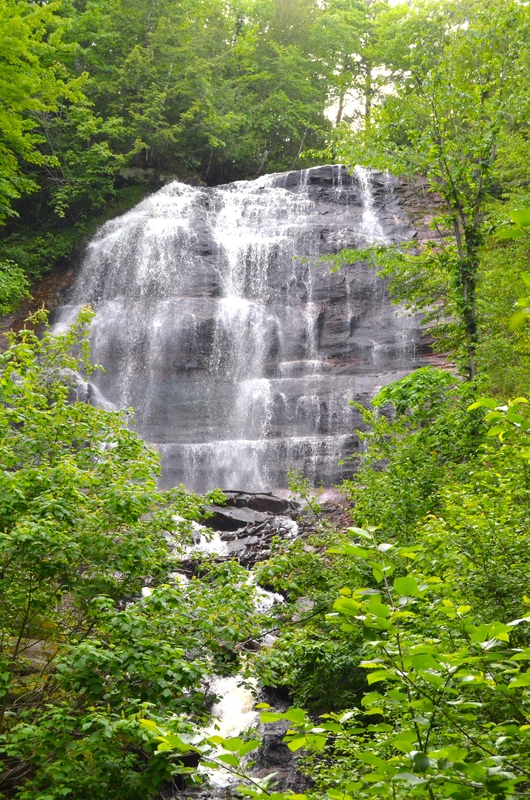 The Upper Falls (shown above) are a 20 foot drop above a reservoir. If water levels are high here there will be water flowing over the dam spillway and some smaller drops in the overflow channel. 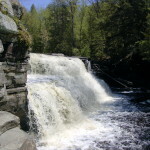 One set of Middle Falls drops is 5-10 feet tall, then another Middle Falls plunge is 20 feet tall and provides easy access to the river (photo at top of post). It’s a bit harder to reach the Lower Falls, but the reward of a view of a wide 50 foot tall cascade is more than worth the extra effort. There are well-worn trails here but no barriers, so use caution but feel free to explore. From M-26 in Hubbell, turn onto 6th St. and follow it to Golf Course Rd. Take Golf Course Rd. up the hill to the second trail road on the left. Park here and walk in, the Upper Falls are to the right, Middle Falls and Lower Falls to the left.